A team of Huntley High School students took first place in the Construction Industry Round Table (CIRT) National Design & Construction Competition in late April. The CIRT competition pitted teams of high school students from around the country against each other to present the best conceptual construction project, from initial idea through the phases of design, construction timeline, and all other aspects up to construction. 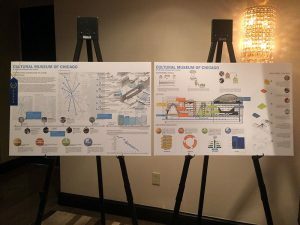 Out of 49 submissions, three teams were selected as finalists to present projects in front of a panel of construction and design industry CEOs in Washington, D.C. ACE Chicago Team 6, comprising four HHS students among 30 Chicago-area high school students, envisioned a project to renovate the Old Chicago Main Post Office building into the Cultural Museum of Chicago, “a dynamic, engaging cultural center for the populous to enjoy.” They beat out teams from New York, New York and Providence, Rhode Island, to take the top national prize. Renderings of the top-prize-winning project designed by ACE Chicago Team 6. Seniors Jonathan Kaye, Marina Cuellar, and Jacob Vickers, and junior Brennan Lighthall represented HHS on ACE Chicago Team 6. They were among 15 HHS students who have participated in the ACE Mentor program over the past six months. The ACE (Architecture, Construction, Engineering) Mentor Program connects industry professionals and high school students for mentoring, and inspires students to pursue careers in design and construction, and provides scholarship funding to help students pursue their education and careers. Since October, these students have traveled to Chicago each week to work with professionals from firms in the architecture, construction, and engineering fields, including Gensler, HNTB, AECOM, and Clark Construction. All students participating in the ACE Mentor Program underwent an application process to join. After being accepted, they received an overview of jobs in the field and began their team projects, with each student taking on tasks aligning with those of a professional in their chosen career path. Max Walsh: $4,000 scholarship and a design and build opportunity. The CIRT competition champions received a $5,000 prize for the Chicago ACE affiliate. In addition, Cuellar and Kaye each received an all-expenses-paid, three-day trip to D.C. for the finals. “It was an incredible experience to both participate in ACE, be honored in DC, and have the opportunity to make professional connections within the industry,” Kaye said. The participants were advised by Nick Wedoff, who will begin a new position as chair of the Career and Technology Education Department next year. Huntley offers a number of related learning opportunities in both the Career and Technology Education Department and the Engineering Academy.